.How To Create A Staple Style. To create a staple style starts with your character and how you express this through your fashion. Mr Yates for example is a perfect example for how to shine through your clobber as we would say in London. Reggie got his first break at the young age of eight years old when he appeared in legendary comedy that is Desmonds. After a year on Channel Five Soap, Family Affairs and the obligatory turn in The Bill, Reggie landed the part of Carl in BBC cult kid’s show Grange Hill. 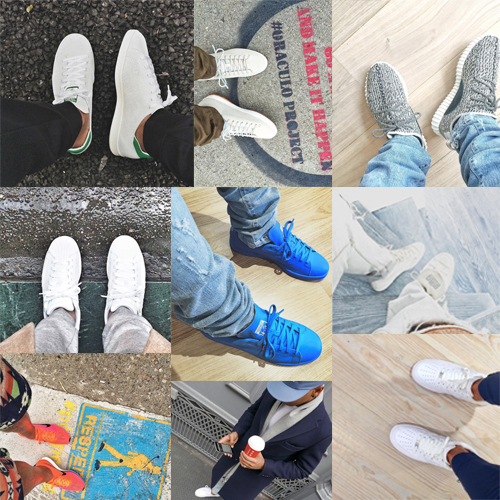 King of on Footwear – Reg brings to life his social media and outfits with his choice of footwear which varies from day-to-day. Below we have chosen a small handful of shots that Reggie has taken for his Instagram (@regyates). Depending on which outfit he is wearing on the day, he matches the trainers perfectly without effort which is why he is one of the most stylish men that we come across on a daily basis. Reggie, has a way of combining high-end designer labels with a street wear edge for example he can throw on a Acne Wool Overcoat with grey fitted jogging bottom from Cos Stores, which he then chucks on a different shade of grey scarf with a pair of classic all white Adidas Shell Toe Trainers to finish off the outfit. Reggie has a lot of high-end brands in his wardrobe by having a flick through his Instagram showing such brands as Acne, Saint Laurent, Gucci, Balenciaga & so many more. He also keeps it high street with the classic brands such as Nike, Adidas, Cos Stores, H&M etc. You know a person has a real love for fashion when you spend so much of your own money on clothing, footwear & accessories of their choice. Now you know your own style, you have your favourite variety of brands to choose the best pieces from the next big question becomes colour: are you going for the all black everything? Acne inspired pastel palette? or a bold late 90s – early 2000s primary patterns and colours? | Getting straight to the point, it doesn’t matter what you choose as long as you make a choice then stick to it so you get the consistency in your wardrobe. Reggie has the ability to wear every range of colour from light summer pastels all the way to the winter classics as black, khakis and grey.